Steps on setting up your own Google Developer account to publish your apps to. By default, we publish your apps to our own Google Developer Account. Send the necessary invites to the Attendify team so that we can publish your app to your account. Using your Google Account, sign up for a developer account here. 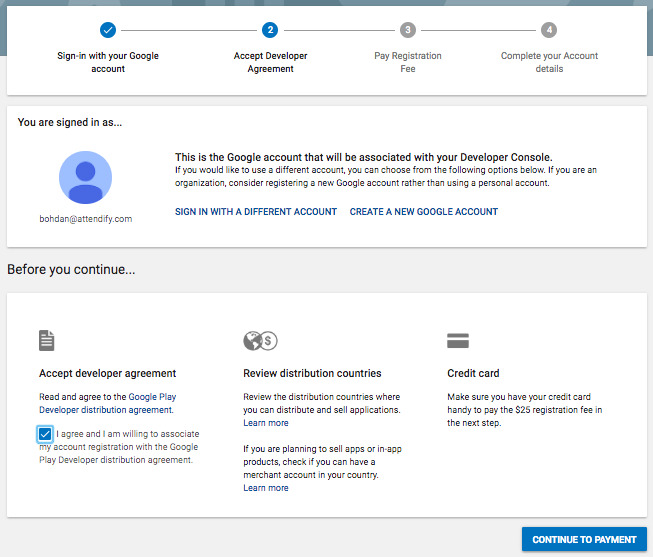 During the sign up process, you'll need to review and accept the Google Developer distribution agreement you can read that here. Type your account details. Your "Developer name" is displayed to customers on Google Play. Go to Settings > Users & Permissions > Invite new user and follow the onscreen instruction to set permissions. Use the "Role" selector to choose the admin role. Choose whether each permission applies to all apps in your developer account ("Global") or specific apps. To add an app to the permissions table, use the down arrow next to "Add an app." To see details for each permission, review the permission definitions section. Send the invite to info@kitapps.com. Attendify publishes on Google Play for Android devices and the App Store for iPhone devices. You will also need an Apple Developer Account to publish a fully branded app. If you haven't set up your Apple Developer Account yet, you can find step by step instructions here.